2012 was definitely an unusual year for me. My job position was eliminated in September 2012 at a hotel I was working at and left me kind of in limbo with life. I had been in the hospitality industry since I first started working. I worked for a catering company for 9 years, and later got a job at boutique hotel as their catering and sales manager. I even went to school and got my bachelors in Hospitality Management. Hospitality and the food industry was all I've known. I was 16 when I first started working and not having a job for the first time in my life, honestly, made me feel lost...almost purposeless. I think I went through a mini depression. I never let it show or expressed it, and instead told myself and everyone around me that this exactly what I wanted. And it was, and is...but someone telling you your job is not going to be around anymore and they won't need you, kind of makes you feel like a failure. I felt like I let my husband down and myself. I then had to evaluate the whole situation and look at the realities. I was so unhappy at my job. I would come home crying from the stress I was constantly under, and my hard work going unnoticed. Also, I had a house that we had just bought that needed a lot of TLC. The house had been neglected since both my husband and I were working and had very little extra time. We still had many things in boxes, and our house didn't really feel like home because of it. I knew this was my opportunity to make my house our home. Buying our first home was such a blessing that I was blinded by a job I didn't even like distract me from it. I knew this time of unemployment was a perfect for me to learn who I am, be confident with myself, and enjoy everything while I am in the moment of it. This blog is that exactly, capturing my moments of change and sharing all the things I love to do. I never thought I would overshare, but it's this is all the reason the blog began. 2012 was, as clique as it may be, a blessing in disguise for sure. Except, I am the one that disguised it. I am so grateful God sustained me and opened my eyes in a time I felt lost. I am grateful I have a husband that supports me. I am simply happy and enjoying things as they come. 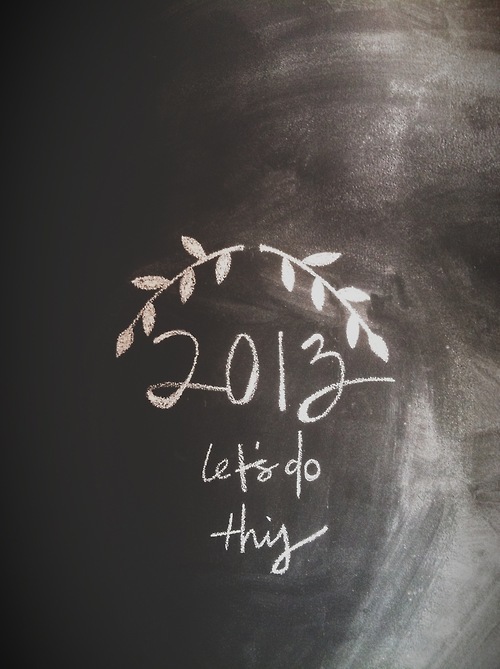 2013, ready or not, here you are.